Answer: Things found under an vintage air conditioner we had to move to prepare for our new hurricane proof windows in the middle son’s room. That air conditioner was about four feet long, three feet high and two feet deep–it looks like a very nice credenza with some fancy parquet work on the front. It is probably sixty or more years old. 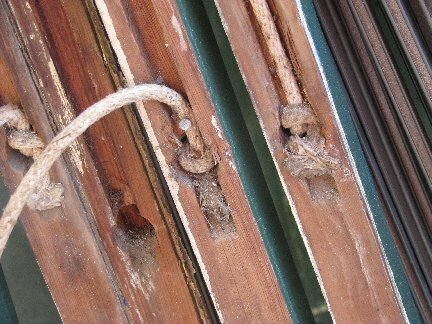 The installers carefully popped out each wooden window–the kind that have the sash cords and window weights and stacked them neatly outside before carting them all off–somewhere. My new windows tilt in for easy cleaning; the old ones required taking apart and sitting on the sill to clean. I did ask but the dust bunny family declined having their photographs on display quoting something about privacy. I am surprised the dust bunnies did not want to connect with their relatives worldwide!